The designs, by president Mark Falvai, challenge the assumptions of how waterproof bags should be built. The innovative design brings together two separate, and typically opposed, ideologies of backpack construction. On the outside is a superior all-weather backpack with large easy access external cargo pockets, urethane coated YKK zippers, adjustable sternum strap, and unbreakable stainless steel hardware. On the inside is a fully waterproof liner with high frequency RF welded seams, creating a totally watertight bag. 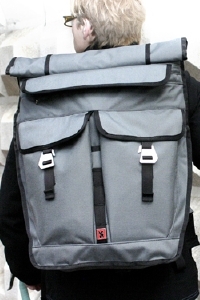 According to Mark Falvai, "I wanted to design an urban backpack that was capable of handling all aspects of life. This dual-bag design creates a bag that is equally suited to land and sea. The Pawn will be able to accommodate students and urban commuters to ensure protection of valuables in harsh conditions." Chrome's line of waterproof backpacks breaks new ground in providing versatility and durability in a technical, yet subtle style for urban trekking. In addition Falvai says, "There is need in urban bike culture for a bag that can be used every day, year-round, under any condition. Our product allows the consumer to break the myth that multiple bags are better than one." To complement their messenger bags, Chrome also offers a line of urban riding clothing.